It can be frustrating cooking for the hubs and Lil L. The husband prefers his food doused in chillies, absolutely no Indian curries and A LOT of meat. In that order. Meanwhile, Lil L must've been a rabbit in her other life. Plenty of veggies but they must be green. No other color will do. God forbid if a chilly should pass her lips. And plenty of fish. There are only 3 in our household. Imagine having 4 kids and a hubby who all have different tastebuds! In that case, I might go on strike and the rascals can fend for themselves. When I was living in Christchurch (New Zealand), there was a little fish and chips shop right across the street. Initially, I was very pleased to be within a stone's throw from a fast food shop. I mean what 18 year old likes to cook when there are far more exciting things to do? The only problem was the wind would blow in a certain direction. Right towards my bedroom window. For the next 4 years. Yup. Joy. Let's just say, I did not touch fish OR chips for the next decade. I had a few fillets of tilapia and pollock in the freezer. Lil L announced that she was positively dying for fish and chips. I for one, have no idea how to make the typical English style fish and chips BUT seeing that I'm Asian, I thought I would try the Japanese version - Karaage. Here's a simple version which takes less than half an hour to jiffy up. It's even faster if you can rope in a few slaves, I mean kids to help you coat the fish cutlets. 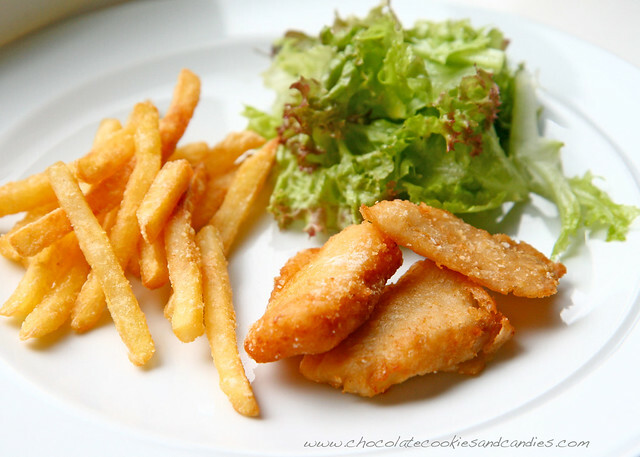 Serve with fries (I prefer McCains frozen fries) and salad. Judging by the moans of ecstasy and the rate the two scarfed down their food, I guess it was a huge hit. We had some leftovers so I made fish sandwiches the next day. I bought half baked baguette which I shoved into the oven, slathered the hot and crunchy bread with aioli, piled the fish in and plenty of lettuce. Voila, another easy and simple lunch for the family. 1. Cut the fish into small pieces (approximately 2 inches by 2 inches). Marinade the fish in light soy sauce, white pepper and wine for 5-10 minutes. 2. Meanwhile, add the garlic granules into a bowl of cornflour and mix thoroughly. 3. Coat the pieces of fish in the cornflour mixture. 4. Deep fry for 5-8 minutes depending on how thick the cutlets are. OMG, such a great idea, my whole family would love this. We all love the traditional fish and chips but having an Oriental alternative is always good! I am that person and my OH likes what your one does! That's great that Lil L loves veggies. I laughed out loud at "imagine having four kids and a hubby with different tastebuds." My parents used to say it all the time. I'm a vegetarian (I've never been into meat) but my brothers love chicken and fish. oh my goodness I must try this... thank you for the recipe!!!!!!! gossssh it looks so good!!!! I have the same headaches with my kiddos having different taste buds! Sometimes I feel like I make ten different meals before it's all said and done. These look delicious! Now I am craving fish & chips! This looks awesome. Thanks for the recipe!! I shouldn't look at this right before bed. Now I will go to bed hungry! Looks so yummy Marlene! Happy to hear it was a hit! Delish! yours look great Marlene! i'm always hearing about the English fish and chips! i like that you've incorporated your Asian influence and twist on the meal. i went to school next to a donut shop. hahaha i would smell donuts every frickin day! hahahaha so i understand how you feel. have a great week! First of all, your pictures turned out so well. Whenever I hpotograph a bunch of brown food, it never looks amazing like this. 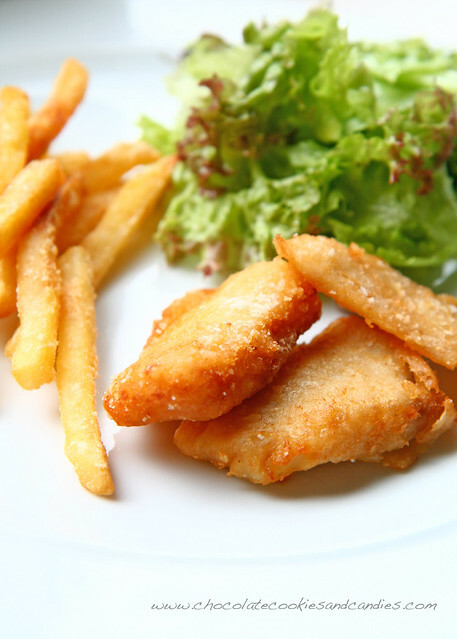 Secondly, I had no idea there was a Japanese version of fishand chips, but it looks and sounds wonderful. No, I didn't know there was an asian version of fish and chips too. Will tell the hubs to get on with making it when he next asks me what I want for my dinner. Does look utterly scrummy though. But then all your food does. And yes, I live in one of those houses where we all like different things. Hubs wants chillies or chilli oil on everything, Ben is a carnivore, George is a rice and noodle fiend and I've got to the point, I'll just have what's left over because I just don't want to think about it any more! That looks like the best fish and chips I've ever seen! I often crave it but nothing worse than things dripping in fat. I think I need another trip to see you just to sample your cooking again! This sounds so yummy! I’ve been trying to think of some new fun dinner recipes - i’m definitely making this!! if I weren't already hungry now I'm officially STARVING. Wow this looks great. You have trained your lil girl well in loving veggies! I've not tried fish karaage but I love making chicken karaage, it's absolutely delicious. And how funny about living near a fish and chip shop, the smell would have put me off too! That looks yummy! I so miss good fish and chips from home... Eaten straight out of the paper on the beach as the sun is going down... Fun times!